Conversational Touch Screen Control that allows the operator to program the machine to cut at a certain RPM with a specific feed rate. This eliminates chatter on hard-to-cut seats by eliminating the human error when trying to machine difficult seats. 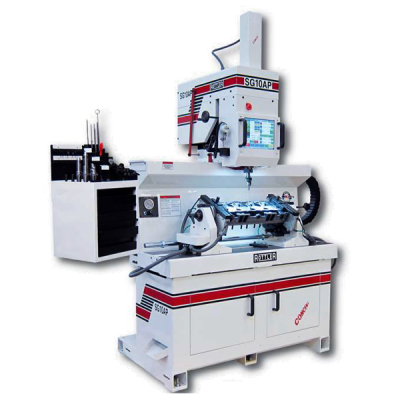 The machine feeds down at a constant rate to a given depth, dwells on the seat at preset RPM and time, and then retracts, all without any operator involvement, resulting in all valve seats machined to the exact same depth – automatically! The SG10A is simple and fast to program – anyone who operates a seat and guide machine can do it in minutes.